Every now and then, along comes a new political leader, and you learn a great deal about the hidden political world -from figuring out why he/she rose to power. There's a party upcoming in New York, at the U.N. --where Iran's new hardline president, Mahmoud Ahmadinejad, will be getting the red carpet treatment. And why not! It's only fitting, for the man who helped burn the election chances of Democratic President Jimmy Carter, thus ushering in the reign of the first cowboy president, his highness, Ronald Reagan. So, no wonder the current bequeathed holder of the Reagan cowboy hat, George W.B., has casually dismissed State Department rumblings about denying a visa to the Iranian leader. "We're still investigating allegations and/or this guy's potential involvement in the hostage crisis," Bush said. Potential involvement will do just fine, to help cement Ahmadinejad's revolutionary nous. A widely-circulated photo claims to show him with a U.S. hostage. But it's not Ahmadinejad, not unless he has had a good nose job. Nevertheless, his involvement in revolutionary, Iranian student politics at the time is sufficient for the launching of this new bad-guy foil for leaders of the 'international community'. Ahmadinejad's most striking achievement to date is that he hasn't got any striking achievements. Not unless you count being installed as Mayor of Tehran by a conservative alliance, on the back of a paltry 12% turnout. He was a nobody when he won that position --only as recently as May, 2003. Next stop the presidency. This was first time an Iranian presidential contest had used two rounds of voting. Which is a great way of finessing into power, a nobody who could never garner enough support in a single poll to defeat the 'moderate' Rafsanjani --otherwise favourite to win. Ahmadinejad's 'election' in Iran was merely a 'democratic' window-dressing on the calculated installation of a low-level, but loyal and reliable political hack as Iran's new secular leader. All rise for President Nobody. Installing Ahmadinejad was a piece of cake. Iran's seemingly democratic election was deeply compromised from the start. All presidential candidates must first be approved by Iran's Guardian Council. Thus, before anybody had even bothered to 'vote', the list of presidential candidates had been whittled down from around 1,000 to only seven contestants. Lucky guys. After the first round of the election, the early partial results put reformist, Mehdi Karroubi ahead. But the final declaration had Rafsanjani barely edging out Ahmadinejad. 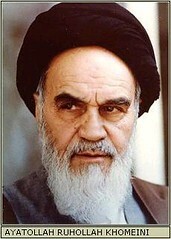 Karroubi complained that the Revolutionary Guards Corps and militia had helped tweak the result. He even alleged that Mojtaba Khamenei --son of the Supreme Leader Ayatollah Khamenei-- was a key conspirator. Reformist newspapers had their distribution halted for airing the issue. It's well overdue that we focus on Iran's supreme religious leader, Ayatollah Khamenei --whose political style makes the last Catholic Pope look like a radical. As was confirmed by what Ahmadinejad did. 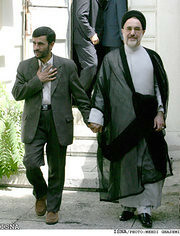 Immediately after he won, Ahmadinejad became the first Iranian president to kiss Khamenei's hand after an election. Which shows who continues to be the real 'Supreme' power in Iran: Ayatollah Khamenei. Post-kiss photos show him leading Ahmadinejad by the hand like a junior. And thus we come to the real issue: why was President Nobody engineered into place? The answer lies hidden in the salt flats Eastern Iran. Along with equipment jettisoned by Jimmy Carter's ill-fated bid to rescue American hostages seized in the 1979 storming of the U.S. embassy in Tehran. Those 444 'Groundhog Days' of the hostage crisis doomed Carter's re-election bid. It was a calculated sabotage. It ended with the release of the hostages --just minutes after Reagan was inaugurated. Which provided the new president with a perfect, feel-good launch pad for his first term. You don't even have to ponder "who benefits"? It's clear who benefited: the Reaganite Republicans. It's also clear that the actions of Iran's hostage-taking Islamic Revolutionary Guards were scripted for them --on stage notes prepared by the unseen authors of this political theatre. If you haven't read part 1 of this article, "The Iran Invasion Drivel" --you may still be under the impression that Iran is some kind of enemy of the United States. Let the relative peace in the Tehran-dominated south of Iraq dissuade you of that notion. Be informed also by the recent power shift in Baghdad, when the secular Mayor was frogmarched out of office at gunpoint by the Tehran-backed Badr corps --the military wing of the Shi'ite-controlled Supreme Council for Islamic Revolution in Iraq. The Badr corps is Iraq's version of Iran's Revolutionary Guard and similarly grew out of the Iranian dissident community headquartered in London --the self-same world capital not long ago visited by Iraq's Shi'ite leader, Grand Ayatollah Al-Sistani --for 'medical reasons'. Paris being another world capital worth our attention --home to Ayatollah Khomeini in exile. The Iranian revolution has been run by these western power-brokers for the start. The recent Iranian custodianship of most of Iraq is just a franchise opportunity bestowed upon them by their elite G8 handlers. And so, another holder of Reagan's legacy rules the U.S. --poised to benefit from a new theatrical production launched with the elevation of Ahmadinejad. A staged drama which is already painting him as President Somebody Awful. President New Islamic Ogre. Domestically in Iran, a new hardline president is a winning strategy to rein in the reformers with their dreams of actual democracy, while also building street cred with the (once cannon-fodder) masses of Iran --to boost a puppet regime dancing to a foreign tune. Strategically, a hardline regime has always been just what the doctor ordered (pun intended) to restrain not only Iran, but many other muslim countries. And internationally, a new Islamic spectre is an ideal opportunity for more diversionary, sanctimonious, hand-wringing by our own oh-so-pious Mullahs in the international community. So, don't burst out laughing when you hear U.S. and European politicians demand that the Iranian hardliners quit murdering and imprisoning reformers --after they themselves quietly ordered the latest hardline victory, precisely to keep the nascent Iranian democratic impetus firmly under the clerical thumb. And, don't burst out laughing if you hear again Sy Hersh, or Scott Ritter utter dire warnings that the U.S. is planning to invade Iran --when they and other CIA Internet Fakes are just trying to do their best to mask the glaringly suspicious quiet in Tehran-run southern Iraq. Finally, don't burst out laughing when you hear Donald Rumsfeld complain that Iranians are letting arms get to the Iraqi resistance, or George Bush say he is "deeply suspicious" of Tehran's intentions. --when the G8 are the ones who tell the Iranian leadership what their intentions are, in the first place. Don't laugh. You'll only give the game away! Shhhhhsh!